In a skillet with a lid, place the meatballs, spices and chicken broth. Bring to a simmer and cover. Simmer for 5-8 minutes, or until the meatballs are warmed to 165 degrees with a thermometer. Remove the cover and turn off the heat. Add the butter and stir the meatballs until the butter is melted. If possible, refrigerate for 30 minutes before serving. Heat the pita slightly before using. 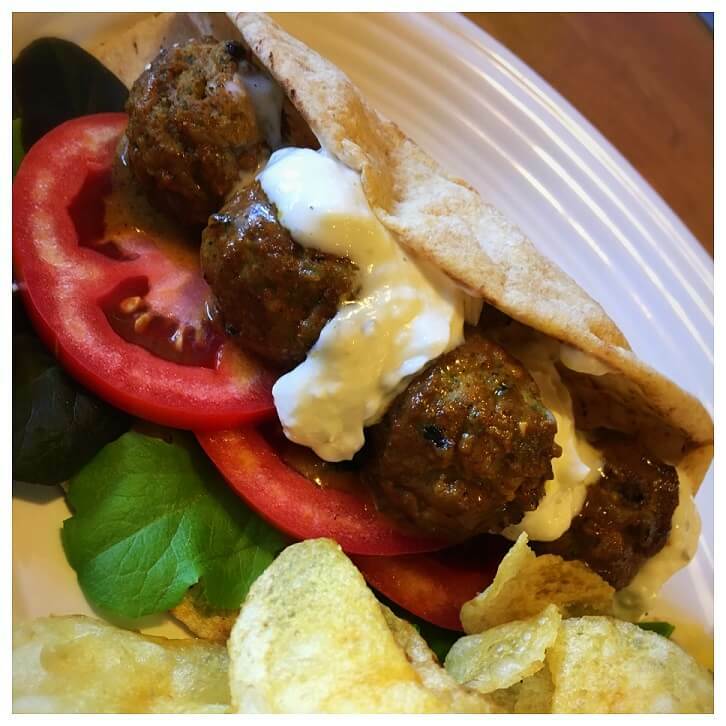 Place a handful of Spring Lettuce Mix on half of the pita. Layer slices of Tomato and Red Onion over the lettuce. Spoon 5 prepared No Name Meatballs over the vegetables. Drizzle a little sauce over the sandwich. Spoon the Creamy Cucumber Sauce over the Meatballs. Serve with chips or a fresh, green salad on the side!